Authenticity as a Path to Happiness | Amy Bucher, Ph.D.
I’ve been doing a lot of thinking and reading about happiness. What does it mean to be happy, and how can people work to become happier? If you think about health and wellness, so much of our resources are focused on combating the negative, whether it be curing an illness or preventing a problem from developing. In fact, when you talk to people about their health (as I’ve done in many user tests and ethnographic research sessions), they’re rarely motivated by these sorts of ideas. Sure, people want to be healthy, and they don’t want to be sick. But they want to be healthy in order to do something else. What they want, in short, is to be happy, and they see their physical health as a way to help them do that. Like pretty much everything worth doing, there’s no single easy or right way to achieve happiness. But in all the reading I’ve been doing, not to mention my own experience, one thing is definitely true: You can only be happy if you pick things that are right for you. Being authentic is a key ingredient in being happy. Just do you. For her Happiness Project, Gretchen Rubin adopted the commandment to “be Gretchen.” Some of what this meant for her was that she would pursue her hobby of reading, which gave her true joy. It also meant admitting to some “flaws” like listening to uncool music. If something makes you feel good, embrace it. If you don’t enjoy something as much, it’s ok to say no to it. I will probably like most of the songs on the top 40 even if they’re not objectively “good,” I like cheesy tv dramas, and I gotta be honest, wine in a box isn’t so bad, especially when you want just one glass after work. On the flip side, I am not a particularly outdoorsy person, I don’t like to read short stories, and even though I love to run, I refuse to do any gimmicky obstacle races, and all of this is ok because these things are authentic to me. Express how you feel. It’s incredibly hard when the emotions you display don’t match the emotions you feel, but that’s a huge part of people’s jobs in service industries. Arlie Hochschild wrote a classic investigation of the emotional labor of people in service called The Managed Heart. These are people whose job requires them to smile and be pleasant even when they may feel frustrated or sad; who must leave their personal reactions at the door and enact “appropriate” emotional responses in their interactions with the public all day long. Perhaps predictably, Hochschild found that this emotional labor is grueling, stressful, and takes a toll on the people who do service work. (A recent NY Times article on the Ann Arbor, MI-based Zingerman’s businesses quoted one employee reflecting on the effort required to be “Zingy” every day.) The upshot for me is that when the situation permits, it’s good to express the emotions you actually feel (if possible, in a measured and mature manner; I’m not endorsing tantrums!). Pick goals that are aligned with what you really value. Sonja Lyubomirsky identifies “authentic goals” as an important prerequisite for committed goal pursuit in The How of Happiness. The goals we select for ourselves should be things that give us, in some form, pleasure. Perhaps the individual courses and exams that comprise medical school don’t bring joy, but tending to the health issues of others does. Working toward a truly valued outcome can help people stay the course when there are obstacles, like organic chemistry class, along the way. Find time for what makes you happy. Kelly McGonigal, in her book The Willpower Instinct, identifies the “what the hell” effect as our tendency to give into bad behavior when we’re already feeling down. This is why it’s harder to eat healthy when we’re stressed at work. But one way to feel down is to not be true to yourself. McGonigal gives the example of a woman who once loved going to yoga but gave it up when the demands of her job increased. Recommitting to yoga, something that aligned with her personal interests, made her feel much better, even though she “didn’t have the time.” The joy that the yoga class brought this woman offset the fact that she didn’t have the time for it by alleviating her stress and improving her outlook. Why does being authentic bring happiness? At some level, this is the easiest question of all. Being authentic brings happiness because it creates a setting where we indulge in the people and activities we love and avoid the ones we don’t. When we are in situations that we may not have chosen, perhaps in the workplace, authenticity gives us permission to react in ways that feel honest and comfortable (within whatever strictures the situation puts forth). It cuts down on cognitive dissonance. Cognitive dissonance is one of those classic psychology findings that I think does drive a lot of human behavior. We don’t like being (or appearing) inconsistent. When inconsistencies in our behaviors and statements are pointed out to us, we’re quick to change our words or even our attitudes to bring everything into line. When we are authentic and true to ourselves, we are far less likely to experience cognitive dissonance because our words and deeds are more likely to reflect our values. It moves us along the motivational quality continuum closer to intrinsic motivation. Goals that are aligned with our authentic selves are more likely to be identified or integrated, if not fully intrinsic. When we value the outcome of a behavior or feel like the behavior reflects who we really are, we’re more motivated to keep it up. It preserves willpower. As McGonigal points out, behaving in ways that feel unnatural or difficult depletes our willpower, making us more likely to indulge in unhealthy or goal-inconsistent behaviors elsewhere. Being true to ourselves helps preserve our willpower tank to use on difficult dilemmas. Obviously there are times when it’s not possible to be totally authentic. Work is an example I keep coming back to, where you may be obligated to respond in a way that represents your employer’s position rather than your genuine self (especially true if you work in a service industry and perform emotional labor!). Sometimes it is also necessary to temper your authentic self in order to preserve a relationship or navigate a social situation. An example (at least for me) is attending kids’ birthday parties. It’s not my favorite thing, but it means something to my friends who have kids that I show up, and so I do. It’s worth it though, because I value those friendships (and there is usually cake at the party). Something that makes me happy is taking photos of Boston when I’m out for a walk or a run. Here’s one of the skyline I took through the railings on Memorial Drive in Cambridge. A tactic I like for getting through these situations is to think about how you are being authentic in a larger sense. At work, you may not really own your momentary reaction, but it’s surely consistent with other parts of your identity like being a consummate professional and a valued employee. At my friends’ kids’ parties, I am not really comfortable with large groups of children, but I do value my ability to be a good friend and to support my friends’ children. Thinking about how momentary inauthenticity works in the service of long-term authenticity can help get you through those times of feeling a bit fake, and make you happier in the long run. 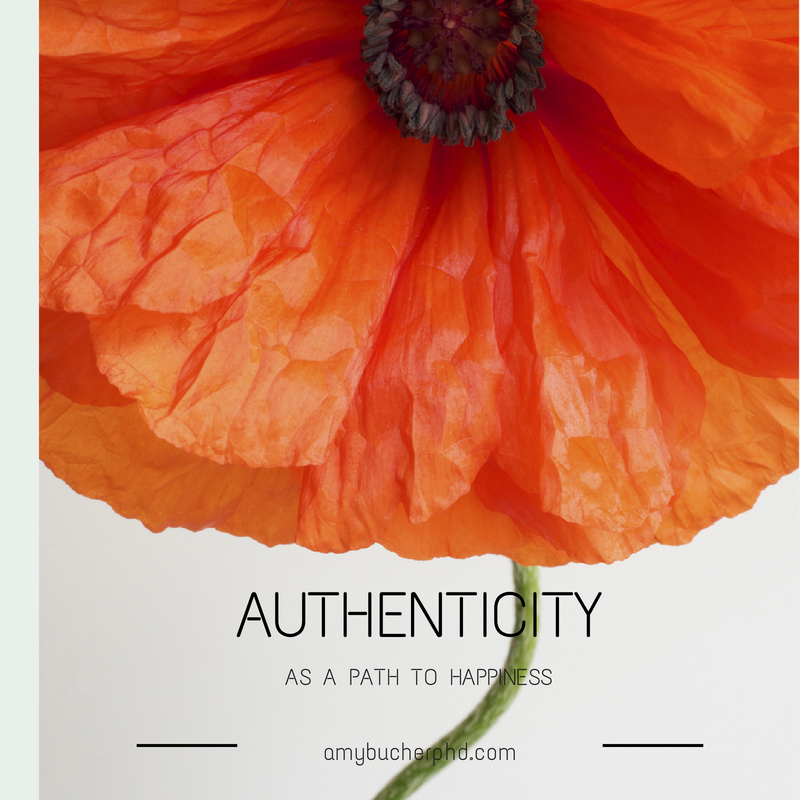 Pingback: Ten Inspirational Quotes About Being Authentically You | Amy Bucher, Ph.D.